Oscar nominations were announced last Thursday and Unbroken, did not make the list. Not that I expected it to. The movie was, as expected, inferior to the book of the same name. Not a criticism, just an observation -they never are. I don’t usually feature book reviews in blog posts because that space is precious and I like to reserve it for teaching or coaching something important about health and fitness. Things that make a big impact on how you train and how you live. But motivation is an equally important topic, don’t you think? As the Hollywood cliché goes…what’s your motivation? I’ll tell you mine. When I first got in the business, an experienced coach told me that getting in shape was 85% “mental.” At the time, I thought that number was highly exaggerated. I’ve since learned that it isn’t. There’s more to life than diet and training and there is more to fitness than barbells and chicken breasts. (versus seeing the film) had such an impact on my training. If you are at all motivated by the lives of people who do great things, then this is a story you can’t afford to miss because staying motivated is a serious topic! "It's cool to be able to see the Navy SEALS and their team with your team," James Devlin said, according to ESPN Boston. "You can draw some comparisons between the two and it's a team-building kind of experience." Although the afternoon at the movies took the team by surprise, it was indeed a move from Belichick's own playbook; last year he did the same thing during the playoff bye week, organizing a screening of the war film "Lone Survivor." The idea behind this outing reminded me that inspiration has to be pursued constantly. That even in the NFL, athletes still need to find ways to stay motivated. Whether the purpose is learning to work better together as a team or as an individual striving to reach his/her personal best. Staying in shape is really the opposite of Einstein’s definition of genius which was, “genius is one per cent inspiration and ninety nine per cent perspiration.” When it comes to staying in shape, you would think nothing could be more fitting. But actually, it’s the other way around. “Staying in shape, (not to be confused with getting in shape), is one per cent perspiration and ninety nine per cent inspiration.” As the Patriots demonstrated, even elite athletes need to stay inspired. In case you’re unfamiliar, the book Unbroken, chronicles the life of Louis Zamperini: petty thief turned Olympic athlete, turned castaway, turned POW, turned religious devotee. Hard to imagine a life experienced in such extremes. Now that’s living. Watching Louis suffer through some grueling Olympic training workouts his brother said, “If you can take, you can make it,” words he carried with him during subsequent Olympic training workouts, through the horrors of his internment in a POW camp, and throughout his life. How powerful his brother’s simple affirmation was. In fact, it was life-changing or in this case, life-sustaining. Words can be incredibly powerful. Writer Jack London once said, “You can't wait for motivation; you have to go after it with a club.” Apparently athletes, are not the only ones who need to keep searching for inspiration. So how do you stay motivated? For me, powerful stories of real-life heroes overcoming all odds is as inspiring as it gets. That’s why I love to read biographies. I love human potential on all levels! Whether it’s Louis Zamperini or Chris Kyle (the American Sniper.) Knowing what they achieved or endured, how they accomplished their goals or adapted to their challenges makes my own determination soar. The pen and paper come out once again to capture my new goals, and I’m off and running; spirit renewed. Stories like these help me understand that anything is possible. Human beings are capable of incredible achievements, enduring incredible horrors, and overcoming incredible odds. If learning about the achievements and triumphs of others doesn’t inspire you, I suggest you do some soul searching and find out what does. 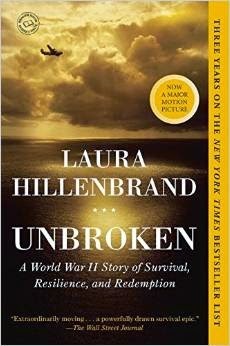 And if you haven’t read Unbroken, I highly recommend it as a good place to start. Do I need to remind you that it’s far better than the movie? Life is difficult under any circumstances. Unbroken is an extreme example of one man overcoming incredible odds to prevail under the most horrific conditions. If Louie Zamperini could endure all that, I should at least be able to get through this next set. That’s the way I see it. Don’t do all the “easy stuff” first - When your enthusiasm is high (at the beginning), remember to leave some of the fun stuff for when you aren’t so enthusiastic. For example, spending a pile of money at Lululemon for your first workout is undoubtedly fun but fashionable leggings are not going to get you in shape. Reward Yourself - When you work toward a long-term goal, it can be hard to see the benefits immediately. Give yourself a reward for your continuous effort toward your goal. Not just for successful results, but for simply making an honest effort. Now's the time for those Lulu-leggings. State your goal publicly - State your goals to friends and family. This will help tremendously toward staying accountable and will dramatically increase your odds of success. Visualization is real – Studies have proven that visualizing your goals as reality goes a long way toward manifesting them. Create your "scene" in great detail. Imagine life when you reach your goal. Imagine how you will feel How does it look? Imagine your impact on other people, etc. Journal - What gets measured gets managed. Write a journal documenting your efforts. When you lose motivation, look back on what you've already accomplished. Fight procrastination by taking immediate action - Start NOW. Just Do It! I want to know what motivates you. How do to stay motivated? Leave your tips for me on my facebook page.